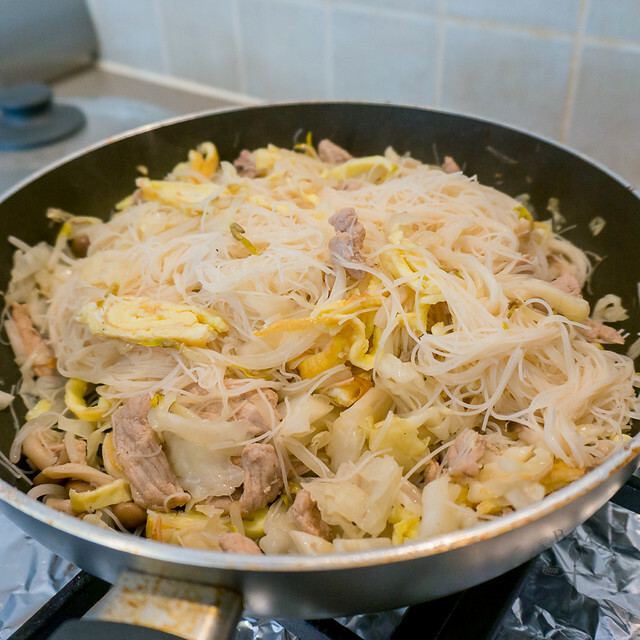 Fried white bee hoon is a delicious dish that appears very often during potlucks and barbeques. It is usually served plain with probably just a bit of vegetables as there will be many other dishes to go with it, especially curry chicken! I love to make mine a one-pan meal with lots of meat, egg and vegetables so I don’t have to think about whipping another dish to go with it. 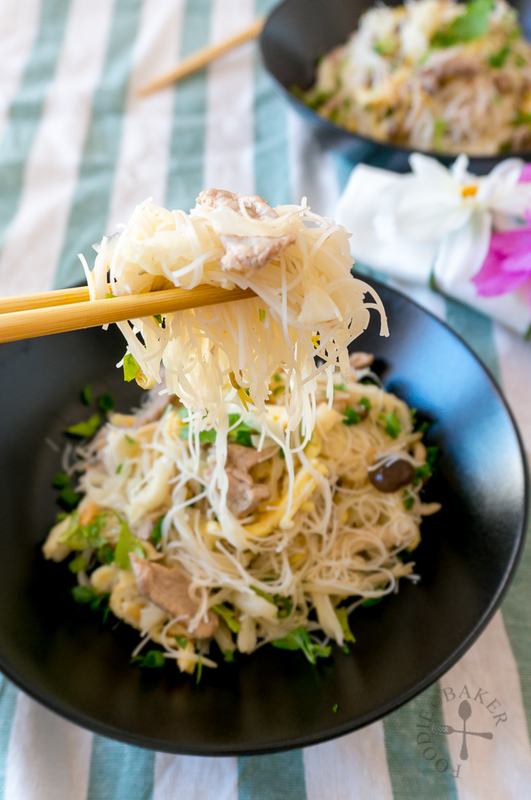 Bee Hoon is a dialect term for rice vermicelli, a type of thin rice noodles. In Chinese, it is known as 米粉 (mǐ fěn). It is one of my favourite noodles and there are different ways to cook and serve it, in soups, stir-fried, with or without gravy (satay bee hoon) etc. My mom cooks bee hoon often as it’s quick, easy and sooo delicious that I will always help myself to a second serving without fail (if my brother haven’t got to them first). 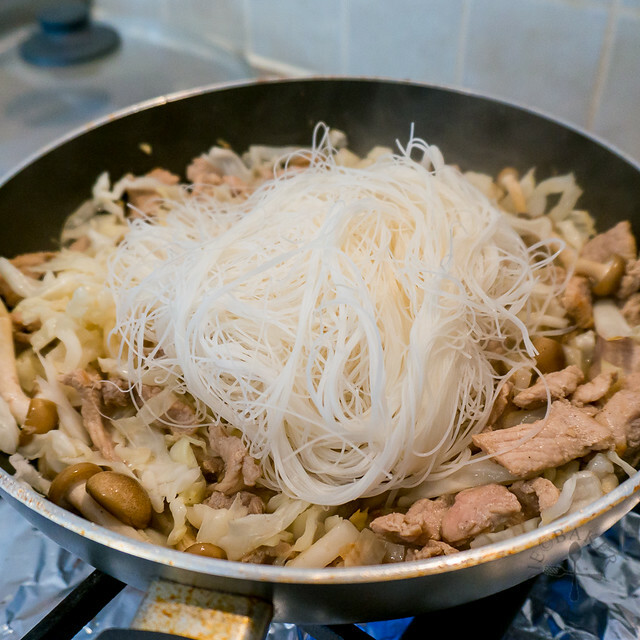 The first time I made this fried white bee hoon was for a barbeque held many months back. I couldn’t use my mom’s recipe as her bee hoon is always the dark kind – deep, dark brown in colour because of the use of dark soy sauce (unless she cooks sardine bee hoon, then it will be reddish-brown because of the chili in the canned sardine). 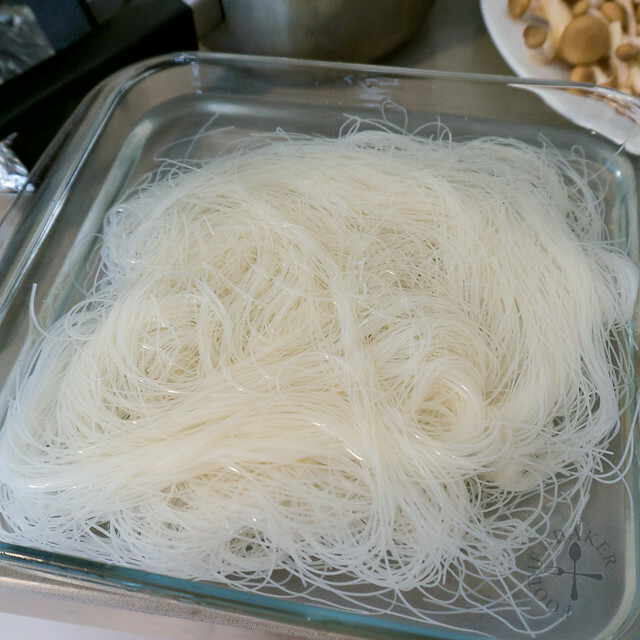 So, I adapted this recipe I found online from Guai Shu Shu (which means “Weird Uncle” in Chinese), and noted that the key to this white bee hoon is to add a bit of seasoned stock for the bee hoon to absorb so that the bee hoon will be flavourful. I’ve made this dish a few times since the barbeque and I love playing around with the different ingredients I can add in – pork, chicken, prawns, squid, cabbage, carrot, bean sprouts, mushrooms, spinach… And one of the best perks of this dish is clean-up is really easy as everything is cooked in one pan (actually wok will work much better but I don’t have one right now). Here’s how to cook it! 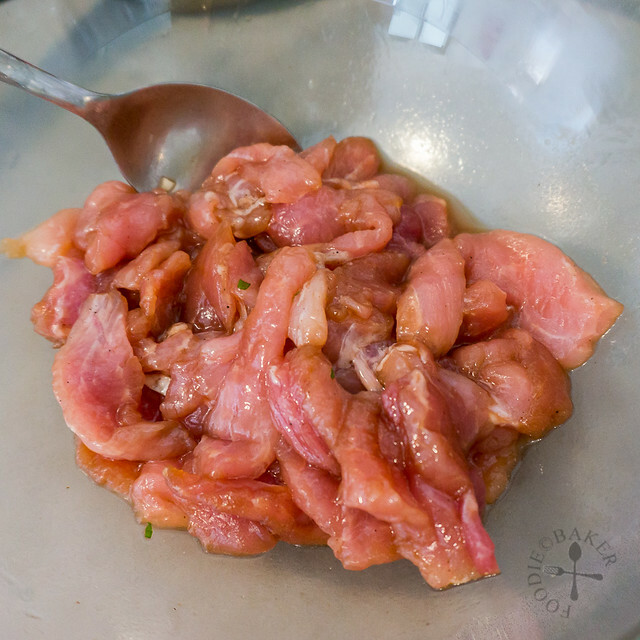 1) Mix pork fillet with Meat Seasoning and set aside for 30 minutes. 2) Soak bee hoon in room temperature water for 30 minutes. Drain and set aside. 3) Chop up all your vegetables (I ran out of carrot, but I'll definitely add them in for colour!) 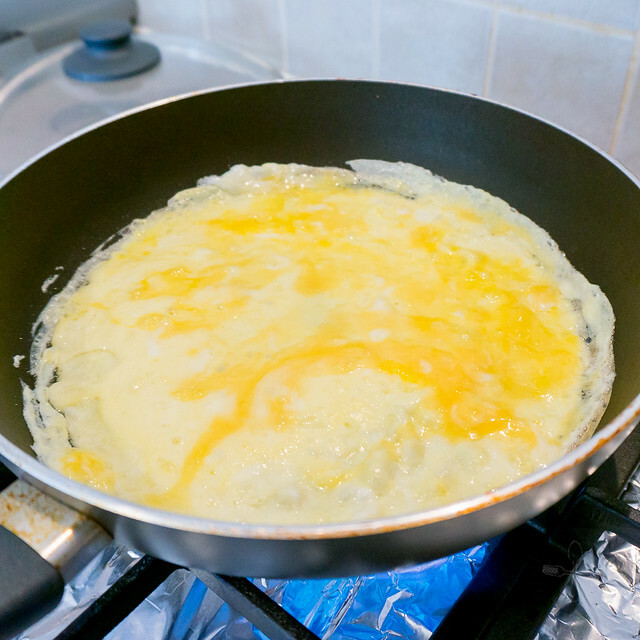 4) Heat 1 tablespoon oil in a wok or deep frying pan over high heat. Add in egg. 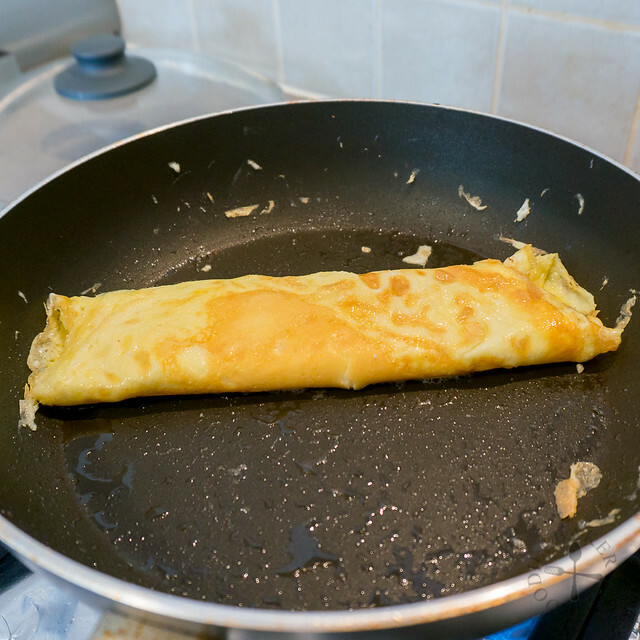 5) Cook into an omelette. Remove and slice into thin strips. 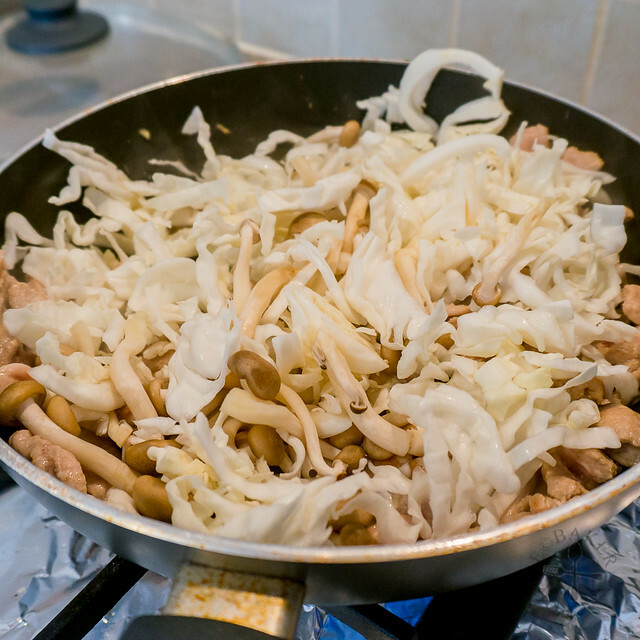 6) Heat remaining 2 tablespoons oil in the wok or frying pan over high heat. Add in the pork fillet. 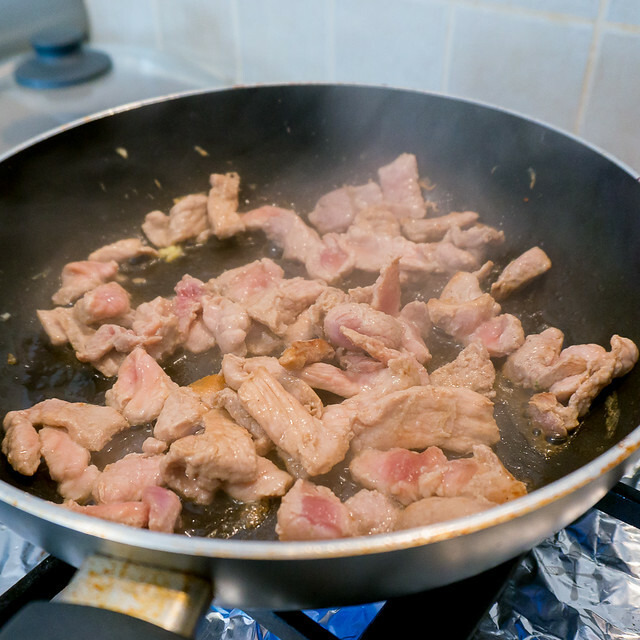 7) Stir-fry until the pork is no longer pink in colour. 8) Then add in the mushrooms, shredded cabbage and carrot. Stir-fry for a few minutes. 9) Add in broth, soy sauce, sesame oil, salt and white pepper. 10) Bring to a boil and stir in the bee hoon. Turn down the heat so that the broth is still simmering. 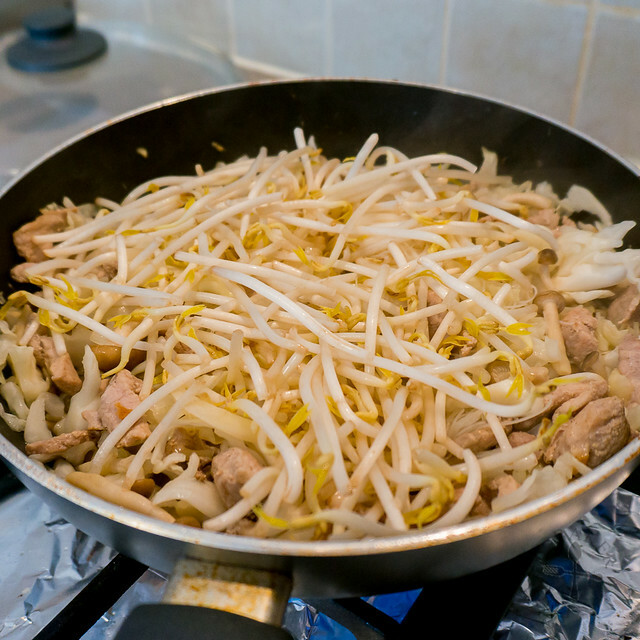 11) Add in the bean sprouts. 12) Cover the pan and simmer for about 2 to 3 minutes, stirring frequently, until almost all the liquid has been absorbed. 13) Remove the cover and add in the thinly sliced egg. 14) Toss well to mix everything together. Mix pork fillet with Meat Seasoning and set aside for 30 minutes. Soak bee hoon in room temperature water for 30 minutes. Drain and set aside. 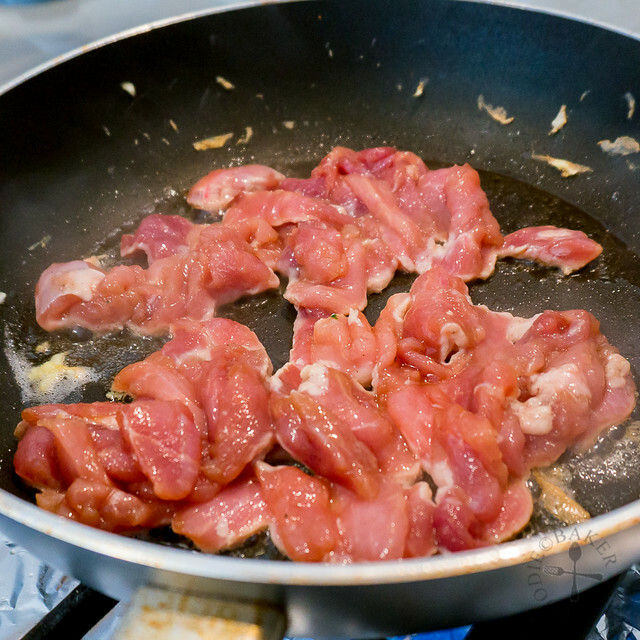 Heat 1 tablespoon oil in a wok or deep frying pan over high heat. Add in egg and cook into an omelette. Remove and slice into thin strips. 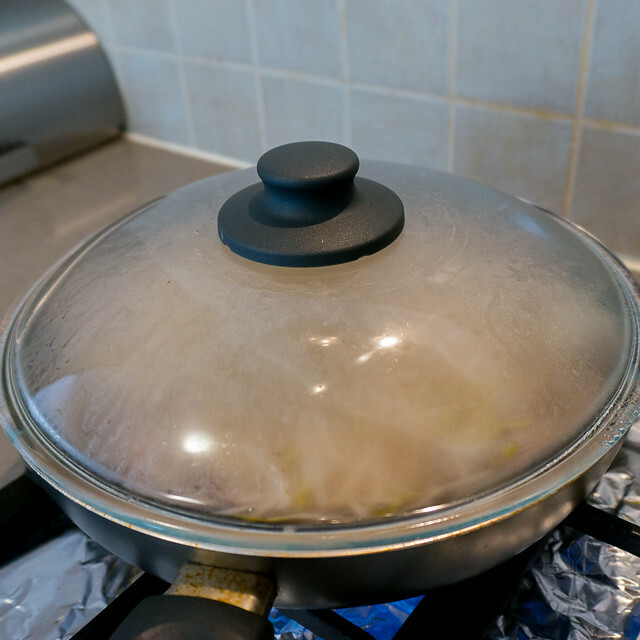 Heat remaining 2 tablespoons oil in the wok or frying pan over high heat. 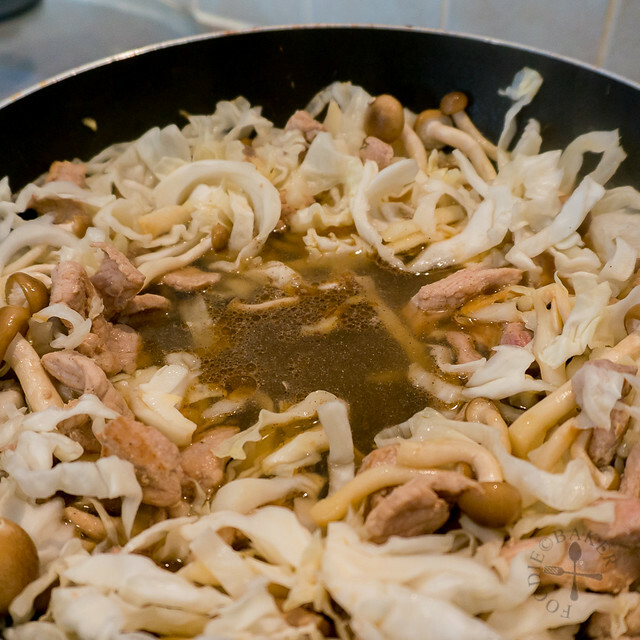 Add in the pork fillet and stir-fry until the pork is no longer pink in colour, then add in the mushrooms, shredded cabbage and carrot. Stir-fry for a few minutes and add in broth, soy sauce, sesame oil, salt and white pepper. Bring to a boil and stir in the bee hoon. Turn down the heat so that the broth is still simmering. 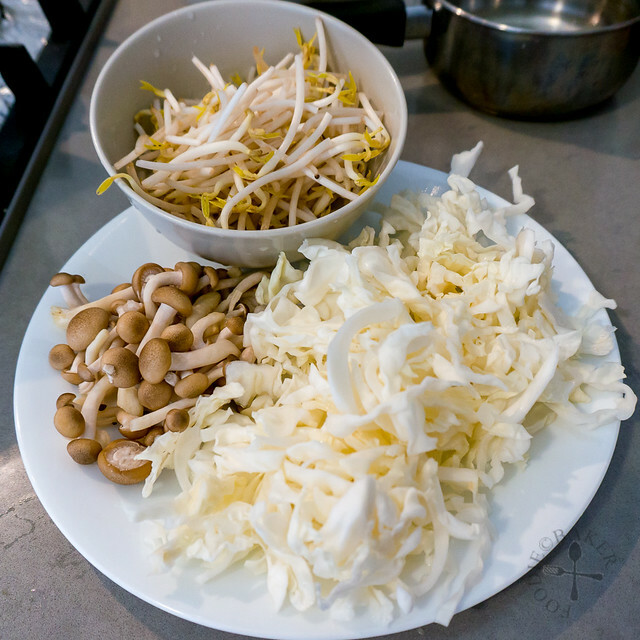 Add in the bean sprouts. Cover the pan and simmer for about 2 to 3 minutes, stirring frequently, until almost all the liquid has been absorbed. Remove the cover and add in the thinly sliced egg and toss well to mix everything together. 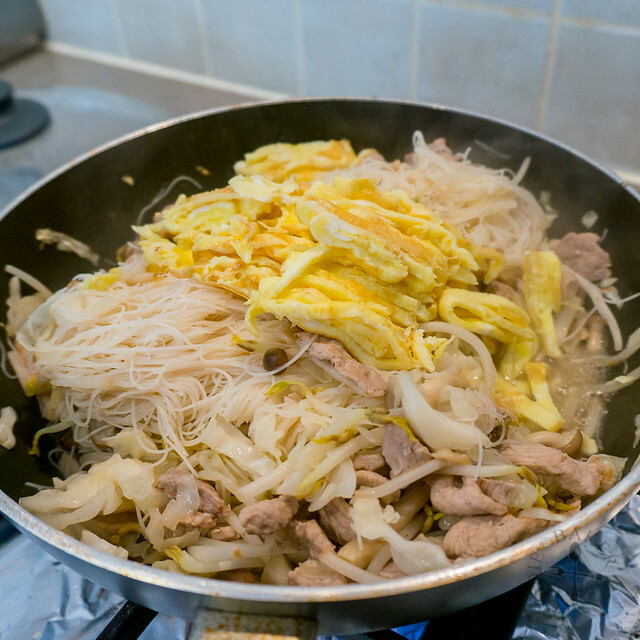 Don't cook for too long as the bee hoon will start to break. Immediately transfer to a serving plate immediately and serve, garnished with spring onion and coriander. - If you don't have homemade broth, you can use stock cubes - follow the instructions stated on the package to make ½ cup of stock. - If you broth is unsalted, you can add in an additional ¼ teaspoon of salt. If your broth is salty omit the salt and reduce the amount of light soy sauce (if needed). - If you are planning to serve the bee hoon with curry sauce, reduce the amount of salt and light soy sauce so it's less salty. - You can play around with the ingredients, using whatever you have on hand and whatever you like (e.g. swap pork for prawns or chicken or squid or fish cakes, cabbage and carrot for choy sum, bok choy...) 2 cups of vegetables is roughly about ½ carrot and ¼ cabbage. These noodles look so deliciously thin! I really want to try it now. And one pan is always a winner! Totally Mir, one-pan dishes makes clean-up so much quicker and easier! This looks super yummy, Jasline. I love a good bee hoon dish. This recipe is for keeps! Thanks Sharon! Yes it is definitely a keeper! You make things sound so easy and you’re making me want to try this! It looks so delicious! Thank you Nagi! I really love this because I can throw whatever leftover veggies in this, do let me know if you give this a try! You make it sound so easy, Jasline, that even I may try to prepare it. When given the choice, I always order rice vermicelli noodles when dining in a Chinese restaurant. It’s my pasta addiction. It would be great if I could actually cook a tasty meal using them. Thanks for sharing. Yay so happy that the comment glitch is resolved by itself! Have an awesome week ahead too! I wish I went to your potlucks and barbecues if this was one of the dishes served…it looks great. Comfort food! So yummy, one of my favourites! Yes, it’s now one of my favourites too! 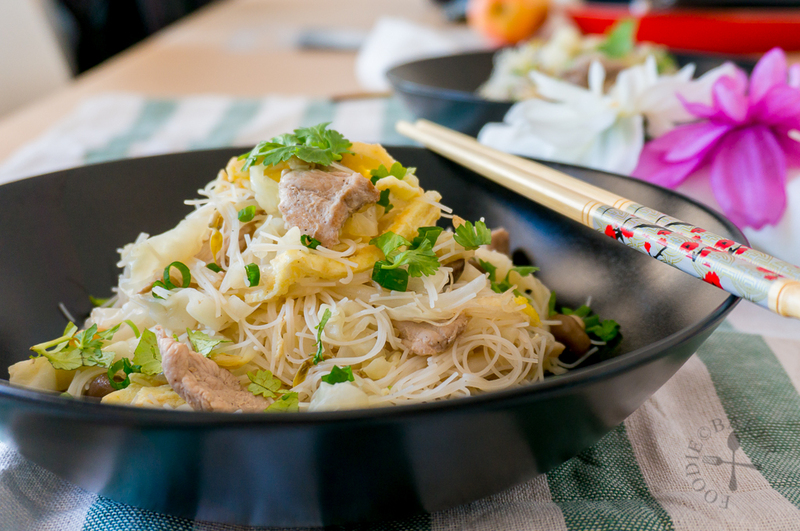 Oh Jasline, please give me a bowl of this noodles for dinner tonight! I really miss stir fry rice vermicelli. 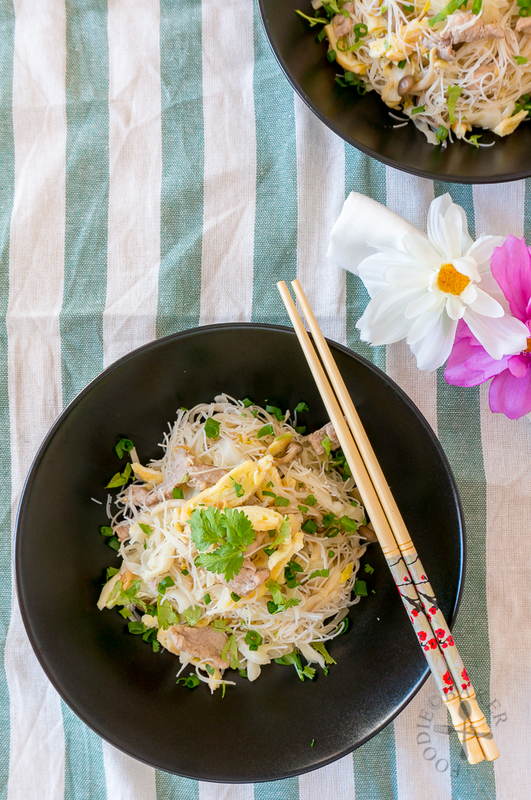 My godmother used to make my sister and I the best stir fry rice vermicelli. I am looking forward to trying your version. YUM! Awww how I wish I can send you one, but I’m sure it will never be as good as the one your godmother made! Hi Susan, I hope you will love this as much as I do! Bee hoon is the name I call this noodle since young, only learned that it’s rice vermicelli when I’m much older! You are welcome, wish I can send you a plate of this! 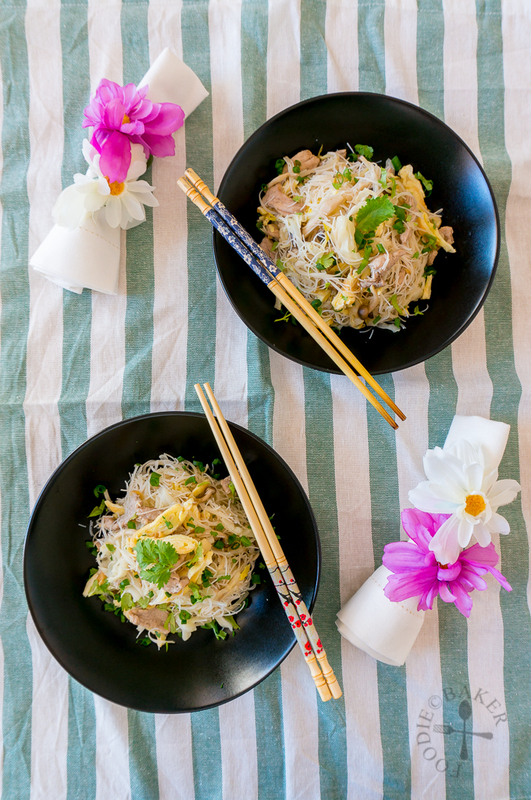 I love bee hon, and you just reminded me that I have not made this rice noodles for a while…thanks for the recipe Jasline. Hi Juliana, it’s time to make some rice noodles then 😉 Have a great week too! I am so hungry after seeing this! 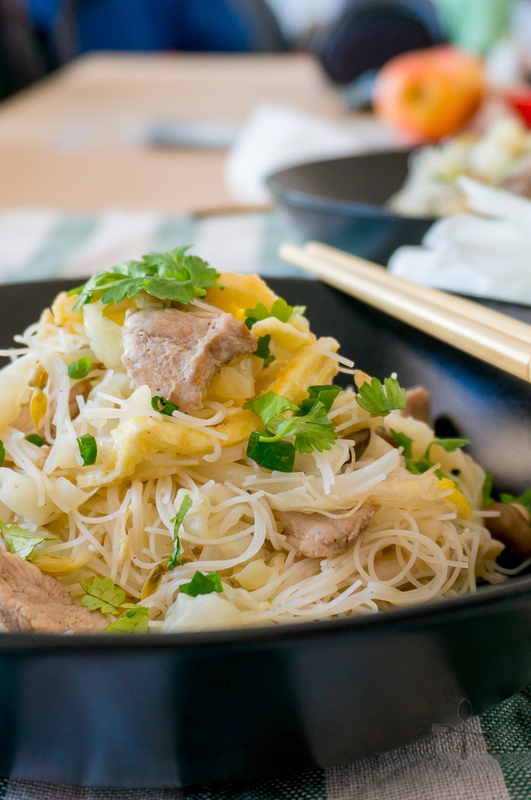 Rice noodles have always been one of my favorites (tied with ho fun noodles) and my mom still makes it often. I love your simple seasoning and the pork. Just delish! Oh my Monica we have the same tastes, ho fun is my favourite too (together with mee sua and tung hoon – I know, I have too many favourites!) Thank you for dropping by! Looks really delicious! We had a potluck at work the other day, and believe it or not, I almost made the Filipino version of this, called pancit bihon. But I didn’t. But I’ve been thinking of the dish for a couple of days. So thanks for confirming that I need to try your version!